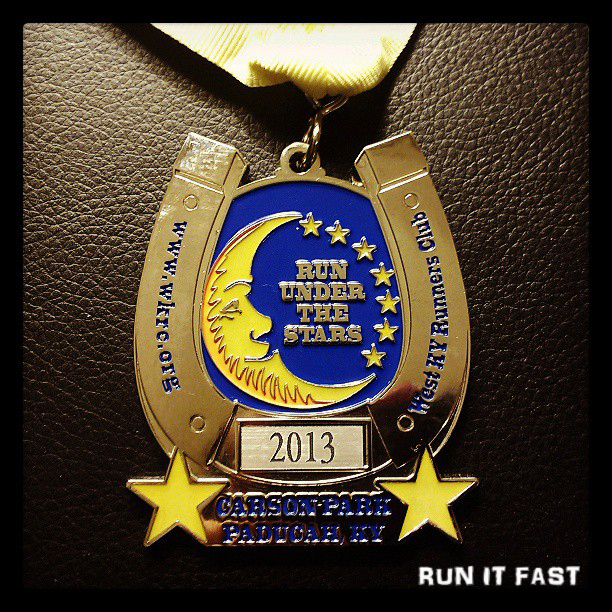 Tag Archive | "Run Under the Stars 10 Hour"
This is the finisher’s medal for the Run Under The Stars Endurance Run that was held on June 7-8 in Paducah, Kentucky. 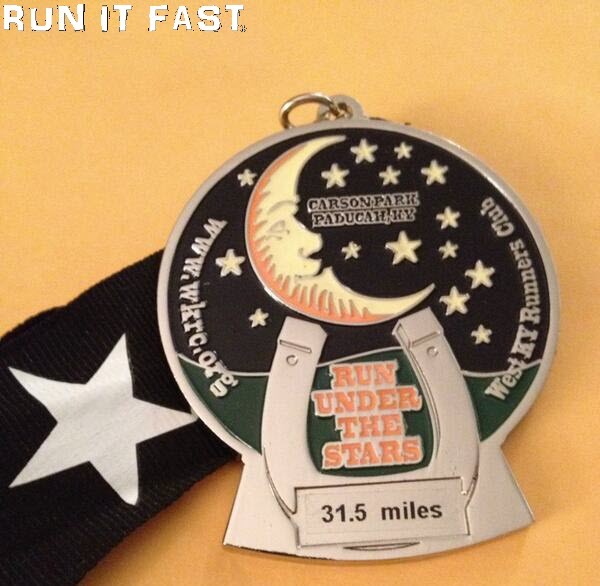 The race starts at 8 pm (on a horse track) and finishes at 6 am so you really do run under the stars. This was my second year running the Run Under the Stars 10 Hour Endurance Race in Paducah, Kentucky put on by the West Kentucky Runner’s Club. Race director Steve Durbin does a great job putting on this race as well as the Land Between the Lakes trail races. 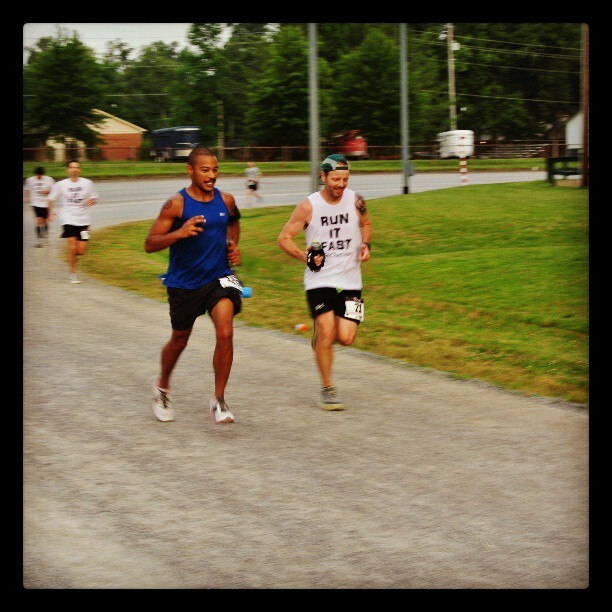 The race takes place at the Carson Horse Park there in Paducah. It’s a half-mile horse track that is composed of crushed limestone. The track is wide and more than accommodated the 75 or so runners that took part this year. The race uses chip timing and keeps track of every lap you make during the 10 hour race. You can run as much or as little as you want. You can even run, rest, nap, camp out, then run some more if you want. Race standings are posted throughout the race to help track the competition. A TV monitor also posts your lap count every time you cross the tracking mat under the race tent. An aid table is positioned right there on the track that you naturally pass every 1/2 mile. This made the need to carry a fuel belt or water bottle less important. The table was fully stocked throughout the night with water, Gatoraide, and Heed for drinks. It then had an assortment of foods that included watermelon, oranges, candy, potato chips, and even pizza & ice cream as the race grew long. 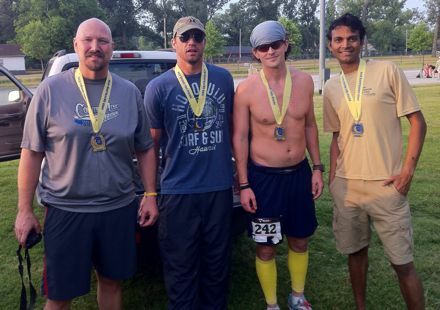 Runners that show up for this race often have varying goals. Some want to run something as short as a half-marathon while others want to tackle a long ultra-distance of 50+ miles or more. Weather for this year’s event was cooler with temperatures in the 70’s for most of the race after a storm front had moved through the area earlier in the day. Last year it was in the mid 90’s at the start and never dipped below 84 degrees. So the weather this year was a lot more ideal for running. Last year, I had found the race online and thought it sounded unique, quirky, and fun. It was within driving distance so I said what the heck. I had a blast obviously as I returned this year for more. I was also excited that I was able to persuade other tormented souls into joining me in the rat race around the oval track this year. The theme song for the race, that got stuck in my head after hearing it on the radio on the drive up, was the Smashing Pumpkins lyric, “Despite all my rage, I’m still just a rat in a cage.” It was and is the perfect song and lyric for RUTS because we were all rats out on that oval cage running off our rage and whatever eats at us and drives us to push our bodies to the limit. At RUTS you are always doing one of two things, either lapping someone or getting lapped. You actually get to know your fellow runners unlike most races where you might only see the competition at the start, finish, and perhaps for a few seconds in between as you run. So you find yourself talking to the other runners, who are friendly and eager for any opportunity to distract him or herself from the 10 hour clock that is ticking down. For that very fact, it’s a great race to run with friends that are faster, slower, or normally run a different distance than you since you can spend time with them every few laps as you make your rounds. My good running friends Chris Estes, Scott Stader, and Naresh Kumar trusted me enough to take my word to join me for the race this year. I showed up at the horse track at 6:30pm for the 8:00pm race start. See that is the other thing. 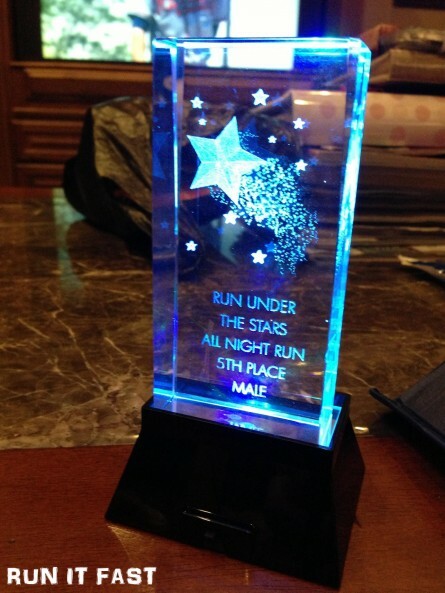 This race starts at 8pm and then you run throughout the night until 6am, hence the ‘Run Under the Stars’ name. After arriving, I quickly put up my tent, along with Naresh’s help. Inside the track’s infield there is ample space to park, pitch a tent, roast marshmellows or do almost anything one desires. Estes and Stader arrived soon after and quickly joined the ultra party. Upon check we received our race bib along with other great goodies like a West Kentucky Runner’s Club running hat, tote bag, tech shirt, and fuel belt. The tent and our vehicles were just 35 feet or so from the horse track. The tent was in front of our cars. Then in front of our cars, just a foot or two off the track, we placed our lawn chairs where we placed all our race gear we thought we might need throughout the night. This way we could just step off the track, grab what we want, then step right back on without losing valuable time tracking inside the infield to get personal belongings. The field had 66 runners this year and 4 relay teams. The relay team runners were often easy to spot because they zipped by me because they had only been running for an hour or short distance. It’s always hard to gauge who is running hard or the furthest on a 1/2 mile loop because you never know the other runner’s goals or if they are going to run the entire time. Someone is naturally going to run harder and faster if they are just running a half-marathon distance or are part of a relay team. You also never know if this or that runner has been resting the past hour in their tent as you’ve been downing more miles. I came in trying to have no expectations, to just run well and listen to my body…but in the back of my head I wanted to run 50 miles. I also wanted to top my 50.5 mile distance of last year. When the race began I started at around a 9 minute/mile pace and ran the first three miles at this pace before I realized it was probably too fast a pace. I decided to slow down a bit and let my heart rate come down to help me find a comfortable rhythm. I didn’t want to labor, especially just 30 minutes into a 10-hour event. I didn’t eat anything the first couple of hours. I just drank water and Nuun. The Nuun is good stuff and about 100x better than Gatoraide. After the first hour I had finished approximately 6.5 miles. I hit 12 miles at 1:57 and the half-marathon mark at around 2:08. I would talk with friends and strangers as I continued to put down miles. I brought headphones in case I wanted to listen to music at some point, but I never broke them out. I don’t like having to wrestle with headphones, cords, and sweaty ear holes while trying to run. With an ultra you can’t just worry about hydration. You also have to worry about nutrition and replacing the calories and carbs you are burning up. You will wilt and die if you refuse to eat. Of course eating when you don’t feel like eating is usually just as difficult. I started with simple stuff like watermelon and oranges. I also would take a Gu Roctane about every 40 minutes. After 3 hours I was at 18 miles. After 4 hours, 23.2 miles. My runner never really slowed as the night progressed, but I had to walk for a 1/10th of a mile once or twice a lap after the first couple of hours as my ankles became extremely tender from some of the divots in the track from the horses. Around midnight the pizza arrived! I took two slices and neatly stacked them on top of each other as I took off for another lap. I ran the next mile while slowly eating both pieces of pizza. The pizza tasted great and provided several hundred calories that would come in handy later on. I reached the marathon distance (26.2 miles) in 4:35 and had 28.2 miles banked at 5 hours, the half-way point. At 6 hours I had finished 33.3 miles. I knew I had a good shot of reaching 50 miles if my body would hold up. My ankles, tender and sore from very early in the race, made me wonder if my running would turn into a March of Dimes walk-a-thon. I was hoping my short walk breaks every half mile would be enough to allow me to continue to run it fast until the end. When I reached 32 miles, I came across Estes on a lap. He looked a bit beat up and told me he had developed a painful blister on the bottom of one of his feet. He had tried to tape it, but the blister seemed determined to slow down Estes or end his night….which it did. Estes, to my shock, told me he was going to finish another lap and call it a night with 34.5 miles. He was going to play it smart. Something runners, and especially those like Estes and myself, rarely do. So Estes retired to the lawn chair near the track and did a great job of offering the rest of us encouragement and support for most of remaining 4 hours. 35 miles came at 6:22 and 40 at 7:23. I had over 2.5 hours to do at least 10 miles. I had my iPhone out to recalculate the pace I would need to reach 50 miles ever so often when I’d hit a milestone (marker). 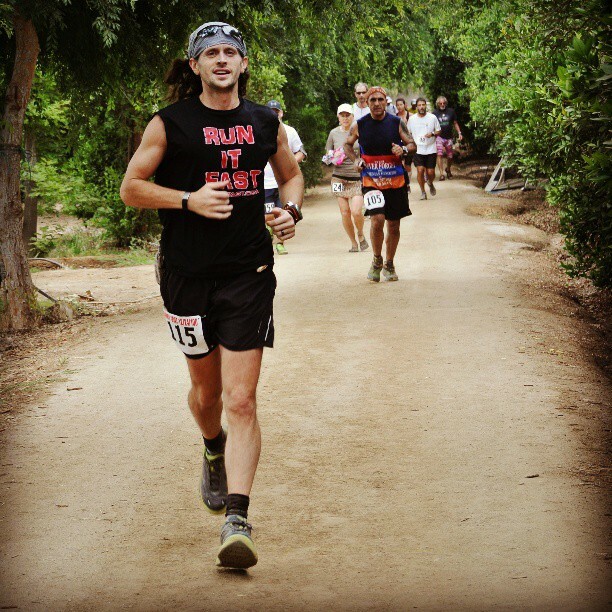 I stayed strong and the pace I needed continued to become a larger and larger number….a good thing! One of the best things that happened during the race took place took place with just a few hours left. I had been expecting and waiting upon it as well. I finished a lap and saw three volunteers standing there, each with a separate box. One had Bomb popsicles, the other Nutty Buddies, and the third had fudgesicles. I grabbed the chocolate one and that ice cream, that had naturally melted a bit in the heat, tasted like fresh cocoa milk off a cow’s udder. It was heavenly and so yum! Those magical volunteers from the big RD in the Sky were there for several more laps with all three ice cream options. I turned it down after the first time for fear my over-indulgence might cause a stomach problem that would turn me into Cary Morgan around mile 20 of a marathon. With 22 minutes left, as the clock hit 9:38, I reached my goal of 50 miles. I felt good though so I kept running. The miles weren’t easy at this point, but they weren’t hard either. I was still running 80% of each lap at a 9:10ish pace. I’d walk just long enough to catch my breath, bring my HR down, and rest my ankles. I came around on lap 102 (51 miles) and saw I had plenty of time to attempt another lap. So I did, but I noticed quickly that my arms and fingers were tingling and going a bit numb. 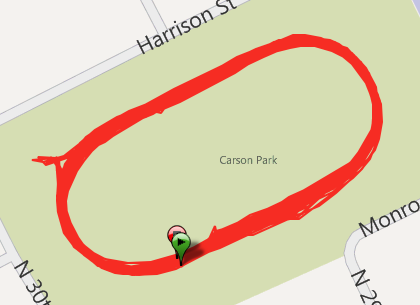 I quickly decided I didn’t want to die on a horse track in Paducah and walked a good bit of that last lap. I finished with 51.5 miles in 9:58:42. 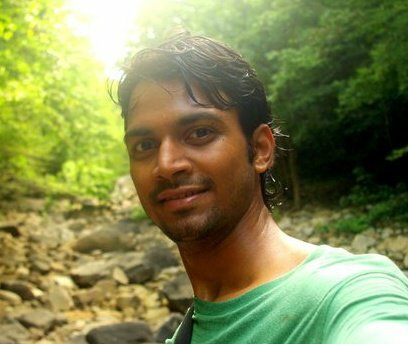 Naresh finished with 51.5 miles as well. We tied for 6th out of 66 solo runners. Stader finished his first ultra, a 50K. Estes completed his third ultra with 34.5 miles. 103 laps around an oval horse track, in the middle of the night, might like a bad idea to some people, but RUTS is a great race that allows you to run with and alongside your friends until the race clock runs out of tick-tocks. I’ve run 204 laps around that horse track the past two years. I’ll likely be back next year for more. I plan to bring even more running friends with me next year!